As the first month of the year draws to a close, the FA Cup reaches round four and the last 32 teams in the hat. Last season's fourth round produced two seismic football shocks. Premier League Chelsea were knocked out by League One Bradford at Stamford Bridge and Manchester City were dumped out by Championship Middlesbrough. BBC Sport takes a look at three ties where Premier League sides will hope to avoid away-day embarrassment this time around. 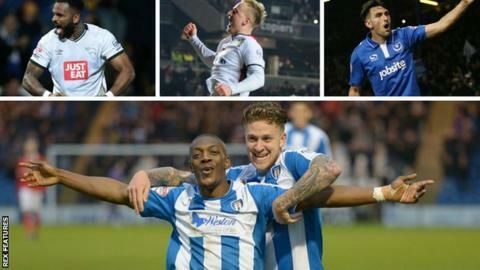 For Colchester United, the FA Cup has been a welcome distraction from their dismal form in League One. But has their run to the fourth round come at a cost? The U's, bottom of the third tier and seven points adrift of safety, have not won a league game since mid-October. They have lost four of their six league matches since Kevin Keen replaced Tony Humes as manager on 21 December, but did shock Championship side Charlton in the third round to set up a home tie with Tottenham on Saturday. And, despite their opponents being five points off the top of the Premier League, Keen is bullish over his side's chances. "People can say what they want," Keen told BBC Essex. "The belief is within myself, [assistant manager] David Wright and the players. "Who says we can't win? It's 11 v 11 at the end of the day." The two teams have never met each other in a competitive match and Keen is plotting an unlikely victory for a side with the Football League's worst defence - having conceded 65 goals in 28 games. "It's like a bonus week," said Keen. "Everyone is going to try to enjoy it, but we're going to try to win the game and get through to the next round. "It's easy for me to say that, it's going to be a tough task, but the boys are switched on and ready to give a performance that hopefully credits the football club." Footballing fortunes have taken these two clubs on very different paths since their last competitive league meeting in February 2013. Bournemouth got the better of Portsmouth in a 2-0 League One win at Dean Court that day. The season culminated in the Cherries' promotion to the Championship and Portsmouth's relegation to League Two, after finishing bottom and with a 10-point deduction for entering administration. A 1-0 League Cup first-round victory for Bournemouth came the following August, but the two clubs have moved poles apart since. Bournemouth now sit among the top-flight's big names after a whirlwind few years, while Portsmouth lie in the play-off positions of League Two. One man who has watched the two clubs' transformations as a manager, local radio pundit and youth development coach is former Portsmouth striker Guy Whittingham. "It's a complete change around for both clubs really," he told BBC Sport. "Bournemouth have done unbelievably well to soar through the leagues with great players and great management. "That's not just on the pitch, but all the way through the club." Whittingham made almost 200 appearances for Portsmouth and managed them for 51 games between November 2012 and November 2013. "I was obviously involved with the two administrations, which were hard and sad times," he added. "But two and a half years on from when the fans took over, things are beginning to get a lot better. "The club's in a different position now for sure." Whittingham also played a significant role in the last FA Cup fourth-round meeting between the clubs in 1991. He scored four goals in a 5-1 win for the hosts at Fratton Park, but admits struggling to remember his exact contribution. "I thought we won 4-0," he replied. "I knew there was a four in there somewhere. I have to try very hard to remember those sorts of days now." Last season MK Dons and Chelsea were on opposite sides of arguably the biggest cup upsets of the campaign. Karl Robinson's Dons trounced Manchester United 4-0 in the Capital One Cup second round, while the Blues fell to a dramatic 4-2 defeat by League One side Bradford City at Stamford Bridge in the FA Cup. Now they face each other in the fourth round of the FA Cup at Stadium MK. "I don't think it does you any harm to take hope from what's gone on in the past," Dons midfielder Darren Potter told BBC Three Counties Radio. "Bradford dug in that day and came back from a losing position to turn the game on its head away at Chelsea - I think we've got to draw hope in any way we can." Both sides are in the bottom half of their respective divisions, MK 20th in their first-ever season in the Championship and Chelsea 13th in the top flight despite winning the Premier League title last term. However, Chelsea are yet to lose in seven games since Guus Hiddink replaced Jose Mourinho. "That tells you everything you need to know," said Potter, whose side lost 3-1 at fellow strugglers Bolton on Saturday. "They've obviously turned a corner, putting in good performances and getting good results - it's almost like the Chelsea you've come to expect from last season. "When you look at the table it doesn't do them any justice at the moment."